What would a visit to Boston be without a trip to the most beloved ballpark in America? Fenway Park is home to the Boston Red Sox, who you can see in action during the regular baseball season. But the ballpark itself is available to tour any time of the year. In a downtown area where space is limited, hotel rooms can be downright tiny. The incentive is made to keep lots of rooms occupied... and when I say a lot of rooms, I mean a lot of rooms. Most of the hotels in downtown Memphis boast of 100 rooms or more. This is a place of volume. That's why a place like the Talbot Heirs Guesthouse is so lovely. A Bowl, A Map, An Idea - Making A Piece For Arkansas Foodbank's Empty Bowls Event. Each year, I paint a bowl for Empty Bowls, the annual fundraiser auction for the Arkansas Foodbank Network. It started out as a "hey, you could do this, too" thing and ended up becoming an annual tradition for me. The Blue Plate Cafe in downtown Memphis is just as good as the original. The Blue Plate Cafe has been a popular stop on Poplar Avenue in Memphis for decades. The tiny lot is almost always packed, there's usually a bit of a line, and it's all worth it. This restaurant is now known as The Kooky Canuck. See an update at the bottom. My travels have taken me to Memphis, where I stumbled upon the Big Foot Lodge on a Sunday night in early January. Hungry from a day on the road and needing a little comfort food, I crawled in. Don't let the restaurant's rustic decor fool you. This is a relative new entry to the Memphis eatery scene, but I think it's here to stay. the Corn Brat (a bratwurst prepared like a corn dog, $4.99), and something called Poutine (a strange cheese covering big hand-cut fries topped with gravy). There are also neat sandwiches, like the Prime Rib Sandwich ($9.49) and the BL"FG"T (a BLT with a fried green tomato, $6.99). And there's even a Fried Ham and Cheese dish, with American cheese slammed between two slabs of honey ham battered and deep fried ($6.99). On this particular night, I was interested in the first special I saw -- the deep fried Cornish game hen. Unfortunately, by 9am that night that day's hens were already gone, so I settled for the meatloaf. I was not going to be disappointed. While I waited on my meal, I checked out the crowd and the interior. Big Foot Lodge has a great bar with lots of monitors showing the big game, whatever the big game is. Draft beer here comes in 34 ounce glasses, big gulps for the hungry crowd. The place was packed with 20- and 30-somethings, checking out the Memphis nightlife. There's even a jukebox, though not one of the traditional push-button and vinyl monsters. This jukebox is programmed for the Information age. My food arrived, and I was greeted with two big individual servings of red glazed meatloaf, a big pile of sweet potato fries, and a cup of cucumber salad. The meatloaf was about the most perfect comfort food I could have asked for. The ketchup sauce is heavy on the sweetness, but goes well with the savory and hearty meat below. The meat and starch (I believe it might be a breadcrumb mixture) tasted of black pepper, garlic, and plenty of onion. A very good balance. The sweet potato fries were about right -- not overdone like at many of the places I've visited. They're cut large, allowing for the centers to be soft while the outside is crunchy. They're skin-on, which worked fine for me. But it was the cucumber salad that really caught my attention. Rather than go the route of a stale dill pickle, the cucumber salad grasps the best of a bread and butter pickle and packs in a bit more sugar for a crisp, delicate touch. I was told the salad is made every day. It's better than most relishes I've had, and lacks the vinegary wang some offerings have included. While I was eating, one of the other tables ordered a Sasquatch burger. Not an individual -- a table. This burger is four pounds of 80/20 seasoned ground chuck, two pounds of bun -- plus lettuce, tomatoes, pickles, onions, cheese, and your choice of condiments, bringing the $19.99 burger to a whopping seven and a half pounds of food. Oh, and it comes with fries. It takes about 40 minutes to prepare, which isn't a surprise, considering all that meat. Thing is, if you're brave enough, you can tackle this monster by yourself -- and if you eat it all within an hour, it's on the house. Just one person has done that so far -- professional eating champ Patrick Bertoletti, who managed to gulp down the whole thing in 11 minutes and five seconds -- and finished off the fries, too. For us normal folks, sharing is perfectly fine. The restaurant also offers some unusual deserts, including S'Mores that you can make at the table yourself (Yay! Not bad at $5.99), a Deep Dish Cookie a la Mode (also $5.99), and the perfect accompaniment for the Sasquatch Burger -- the Yeti sundae, a $14.99 beast with 18 scoops of ice cream and a plethora of toppings -- the stuff fatal ice cream headaches are made of. Unfortunately, my meal topped me off for the night, so I'll have to catch one of the sweet delights on another visit. 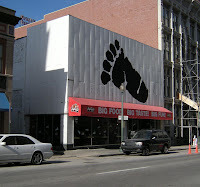 Big Foot Lodge isn't far from Beale Street -- it's catty-corner from the Peabody Place Entertainment Complex on Second Street, on the north side of the boulevard. The physical address is 97 South Second. It's open from 11am to 2:30am -- and the kitchen stays open late, so it's a good stop for late night wanderers. Want to find out more? Check out the Big Foot Lodge website -- or call (901) 578-9808. And they do offer carry-out orders at no additional cost -- though I doubt you could get the Sasquatch burger free on competition unless you stick around. UPDATE 9-30-10: Grav and I tackled this burger for Serious Eats.